Americans enjoy big trucks, big engines and big power, and for the 2020 model year, automakers aren’t denying customers of their basic desires in the latest crop of 3/4-ton and full-ton trucks. So if a massive 6.6-liter V8 in the upcoming 2020 Chevrolet Silverado HD isn’t large enough for you, how about the 7.3-liter V8 in the 202o Ford Super Duty? Both trucks will be released in the coming months. Here’s why we’re bringing this all up, because the latest news surrounding the 7.3-liter engine doesn’t actually have much to do with the Ford Super Duty. It has to do with the fact that the 7.3-liter V8 will be able to fit into other Ford vehicles currently on sale. Now that doesn’t necessarily mean that Ford will actually stuff the massive V8 into other platforms, but perhaps one of you out there are bold enough to do it. Last week, product spokesman Mike Levine told Motor Authority at the Chicago Auto Show that the 7.3-liter V8 Ford Super Duty engine fits in both the Mustang and F-150 pick-up. As we mentioned, it might possible in terms of dimensions, but that doesn’t mean that Ford will do it. Levine said that the 7.3-liter V8 is a truck engine with an iron block. Therefore, it’s not very light and wouldn’t make very much sense under the hood of a Mustang. Just because Ford won’t do it, doesn’t mean that a courageous builder won’t fab one up for SEMA. If the burly Ford Super Duty V8 won’t make it into a Mustang, that doesn’t mean it won’t end up inside of a standard F-150, or even the Raptor. After all, Ford hurt a lot of feelings when they bailed on a V8 in the Ford Raptor for a more powerful twin-turbocharged V6. Sure, the new Raptor makes more power, but it doesn’t quite sound the part like the first-gen Raptor did. The 6.2-liter V-8 will be the standard engine in the 2020 Super Duty lineup, and still Ford hasn’t released power ratings for the 7.3-liter V-8. We’re hoping for big numbers from the big V8, and we have a feeling that Ford will not disappoint. For more Ford F-Series news, subscribe to Ford Authority. Keep you “old” push-rod 2 valve OHV relic from the fifties> 7.3 liter v8 out of the “modern” Mustang. Ford went ahead of the comp. with 4 valve DOHC now they’re just slipping backwards with the “pass-use-bye date” OHV stuff. Shame. No shame because there are good rationales. It’s price effective torque. The higher rpm dohc power advantage shrinks for large V8s. Ideally, build what people like. Though, I hold animosity for foreign displacement taxes and capitulation with US makes. But (with Ford tooling for pushrods), I’d be okay with a U.S. tax on new vehicle engine valves with a turbo multiplier and no CAFE. The 7.3L can fit in the mustang but Ford won’t put the 7.3L in the mustang. Let’s break this down for a second and give it some serious, rational thought. Ford says that the 7.3L iron block is too heavy and doesn’t fit the mustang’s go-fast mission basically. Ford is the only one out there with a DOHC V8 engine while both Ford and Dodge have pushrod V8 engines and they work amazingly well. Both the 6.2L LT1 and the Apache 6.4L V8 both out torque the 5.0L Coyote V8, even if Ford can produce more horsepower as the Bullitt makes 480hp but only 420tq whereas the LT1 makes 455hp & 455tq in the Camaro and the Apache-392 Hemi V8 makes 485hp and 470lb-ft . What Ford’s message didn’t say is that Ford couldn’t take that same style block, make it aluminum, give it the same Plasma Arc cylinders and strength design of what they’ve done with the new GT500, give it about 5.8L of displacement, aluminum Boss 429 style heads with the dual fuel injection system, an updated GT350 style exhaust manifold, 92mm throttle body, cold air induction, Tri-Y tubular exhaust manifolds, a proper camshaft and a tune and I’m quite sure this engine would pump out just as much power as the current 5.0L V8 with less weight and be more condensed and compact than the current coyote V8. Not to talk bad about Chevy, (this is actually a bit of praise to them) the 5.7L LS6 in the older Corvettes put out 405hp and that was with tech from the early 2000 era. I’m sure if we took a 5.7L LS6 and stuffed it with more modern tech that car would push 475hp with no problem. I see no reason why a 5.8L Ford would be any different. With 3 less camshafts, smaller cylinder heads and a forged rotating assembly I’m sure this setup would save at least 80lbs off the nose of the car. This would make sense if Ford is looking to add a hybrid Front drive system to the mustang, which would only add weight. 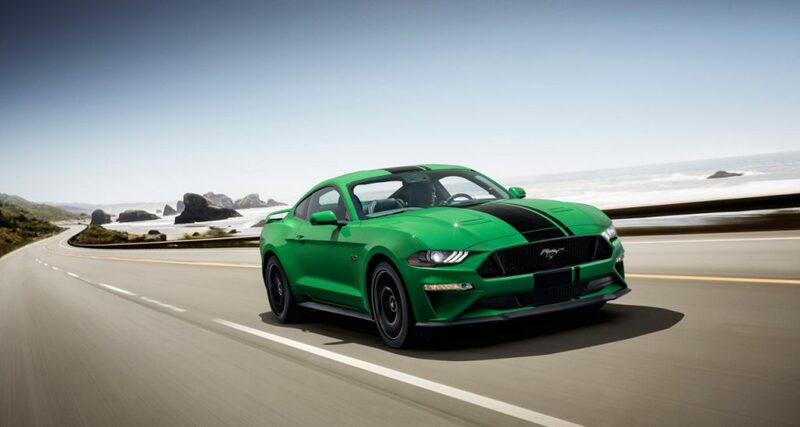 With Ford about to Change the mustang up in 2021 and moving it to the CD6 platform, a more compact engine makes a bit of sense. Ford also has that new 10-speed transmission plus the modular 10-speed hybrid drive transmission. While I wouldn’t expect Ford to turn up the volume of the hybrid-electric motor to the same level they did on the Aviator. Let’s just say the 5.8L makes 460hp/450tq (hypothetically) even low setting that would put the car at 475hp still, but have 500lb-ft of torque, that’s still a pretty darn good car. Those numbers best the Camaro and the Charger and do it with a smaller engine. And if the Corvette can pull nearly 30mpg with a 460hp 6.2L V8 with a 7-speed auto, why couldn’t a smaller 5.8L V8 with a hybrid 10-speed transmission pull 32mpg? Ford has something up it’s sleeve with everything new that’s coming in the next few years. I see the new mustang being an improved SN95 mustang and here’s why say that. The new mustang is going to have a much sleeker, rounded design (similar to that of the new BMW M850i) but it will still have it’s mustang cues. I do believe both Shelby cars will be gone and the GT and Cobra models will return as well as an “LX” type model below it. This new car will take everything Ford has learned from the GT PP-1/GT PP-2 and put that in the S650 GT along with this hybrid setup. I believe the Cobra will take the DCT 7-speed, with a supercharged variant of the new engine and push 650-720hp. Keeping it in line with the ZL1 and the Hellcat but it will be a more balanced car than the two of them. Ford Also could also return the 428 Mach 1 to the mustang, a 7.0L V8 (similar to what GM did a few years ago with the Z28 but i don’t think the Mach 1 would be a track rat like the Z28, instead i think it would be a N/A street performance car to sit between the 5.8L GT and the Cobra. Also, think of the Raptor. Dodge is coming out with two new monster trucks, the Rebel TR and TRX. Ford would be dumb to think that that BS 3.5L Ecoboost is going to do anything against a big block V8. Now obviously a modern 428ci V8 would pair up nicely with Mopars possibly upcoming 426ci Hemi and a possibly return of the 7.0L GM small block that Chevy had a few years ago that could easily be put in a truck. The F150 is going through a design change soon and it is possibly that a F150 Lighting with a supercharged 5.8L V8 could make its way back into the mix with an AWD setup and a bunch of other things from Ford, just like a new Harley Davidson and Raptor could make their way into the fold with the Harley getting a non supercharged 475hp 5.8L V8 and the Raptor getting a 7.0L 428ci V8 to battle dodge head on. Talks of the 426ci Hemi making roughly 535hp and being put in the Ram 1500, Challenger and Charger have been floating around for awhile, and if they get them, you know the Durango will too. For Ford not to take the same initiative and do it in their own style would be kind of dumb. Plus the rumors of an F250 highboy to take on the Power wagon would make sense with a 7.0L Ford V8 to Challenge the 7.0L Hemi. Also, there is the new Bronco to think about and the new explorer. The Explorer is on the CD6 chassis as well so if the pushrod engine would work in the Mustang it would work in the explorer too and a 475hp 5.8L explorer would go toe-to-toe with the 475hp Durango but with a much smaller engine and a 10-speed trans, possibly the 10-speed hybrid. As of now, the Bronco is the wild card. With rumors that the Ranger will get a new platform soon plus Ford moving to less independent chassis vehicles meaning the Ranger may be built on a variation of the F150 platform plus the fact that the new F150 will debut before the Bronco, there is a possibility that the Bronco may receive a pushrod V8 as well and what better way to welcome it back than with the engine it left off with, the 5.8L. Of course, it would be tuned down from the High performance 5.8 to probably around 430hp but it would be fitting for the Bronco to have a V8 option. Another thing is this from a Tech standpoint. Although a 5.0L V8 is a good engine and a fairly problem-free engine, a pushrod engine is simpler to work on and if done right, just as reliable. The 350 Chevy Small block is one of the worlds most reliable engines and has been for a very long time and it’s been used in everything because it can handle it. The simple design makes them a pleasure to work on when they need to be worked on which makes them a shop favorite because tech’s can do what is needed to get them working in short order. Honestly, me personally, I would love to see the Mustang go back to a 5.8L and 7.0L V8 with a base 2.3L turbo and a Supercharged 700hp Cobra. Same thing with the Camaro. A 2.7L RS, a 5.7L Z28 and a 7.0L SS Camaro would be plenty with a ZL1 at the top with some supercharged 700hp V8. Giving the Camaro a more modern F-body design, picking up where it left off in 2002 and calling it a day. Chevy could bring back the Trailblazer and the Trailblazer SS along with a full size Blazer package for the Tahoe in 2 & 4 door with a 5.7L V8 just like Ford should do with the Bronco with a 5.8L along with a Bronco with a smaller 2.7L Turbo V6. as Far as trucks Ford would have the Ranger trucks, the F150 trucks (Lariat FX4, Lariat Classic FX4, Lightning, Harley Davidson, Raptor, King Ranch, Limited) F250HD models (Lariat FX4, Harley Davidson, High Boy, King Ranch, Limited) and whatever models go above that. The Bronco needs and Eddie Bauer off road edition which should be where the 5.8L V8 is offered, while the FX4 and lariat slot in with the 2.7L V6. Another thing I wish Ford would do would be to bring the Everest up to take the place of the Edge and the Baby Bronco (whatever it’s going to be) would take the place of the Escape. As we understand, Ford is also making a mustang inspired crossover as well as some 4-door mustang inspired car. What would be nice is if Ford Brought back the Taurus, the way it should have been as a Charger fighting midsize sedan on a rear-drive CD6 Chassis with the aforementioned Mustang drivetrain options such as a 2.3L turbo, a 5.8L a 7.0L and a supercharged V8, this time, evolving the Coke-bottle shape the Taurus was originally known for with a gran-coupe like styling and greater mustang influence. This along with a mustang inspired crossover with electric options, hybrid options and a 5.8L V8 option would be like a poor-mans BMW X6M. This would also hopefully spur Chevrolet into a midsize performance alpha-2 VSS-R platform sedan or quad coupe, a performance crossover (rwd based variant of the current thing they call the blazer) a Trailblazer, a True Blazer, revisng the name of the Colorado back to the S10 (and give it an Xtreme version, a ZR2 and a ZR5) the Silverado (WT, Z71, Classic, SS, Cheyenne, Reaper, & High Country) Silverado 2500 (WT, Z71, Classic, Scottsdale, High country). At this point, Dodge would redesign the Challenger, or retire it and bring out the Barracuda as a sleek fastback style coupe with an all new 5.9L V8 Magnum which would take the best from the 5.7L and upgrade it with the Apache heads, Mopar hot cam, Apache intake manifold, throttle and intake, revised exhaust manifolds, a new exhaust, a Torqueflite 10-speed and a few other things to better compete with the new mustang and Camaro along with the 7.0L AAR Cuda V8 pumping out 535hp and on the top a Cuda Devilfish with the 717hp 6.2L V8 The Charger would remain but evolve into the next generation with the 5.9L R/T, a 7.0L Daytona and a Hellcat. The Durango would receive the same V8 powertrain and all of them would get a base inline-4 turbo engine rated at around 350-380hp. Returning to dodge (in this fantasy dream world of mine) would be the Dakota pickup truck with an R/T 5.9l (best muscle truck ever made IMO) and a 535hp version with Rumble bee nomenclature. the Ram 1500 would get the Laramie, Big Horn, Long Horn, Limited Rebel, Rebel TR, Rebel TRX & Daytona), the Ram 2500 would get Laramie, Big Horn, Long horn, limited, & Power Wagon) and the models above would do their own thing. Also the Ramcharger would return with the 5.9L V8 plus a smaller V6. What would be even nicer is if each brand went to a 3-car tier. Ford would have Ford, Lincoln and get Mercury back, GM would have Chevy GMC/Pontiac with Pontiac being the car lineup of GMC which would eliminate Buick, and Cadillac would be the Top tier, while Mopar would get Dodge, Jeep and Ram which would drop Chrysler out of the picture for good. It would bring jobs back to Detroit along with the states, we’d have alot of the cars back that we truly miss and also it would allow for more auto industry jobs to open up in places where the country’s economy has dipped. Granted alot of this would never happen but honestly it would be nice. Just go back to having simple cars and fun cars. yeah Hybrids will be here and so will electric cars. It’s truly a given and we all get it. But simple V8 pushrod performance cars would not only be more fun but it would get people back into enjoying cars because they can get back to tinkering, giving us something to do besides social media. It would give the aftermarket companies a refresh and omg all the things it would do! even if it was just for 10 short years it would be awesome just to be able to have that kind of era one more time. I’m sorry i started reminiscing of times when the auto industry was a much happier place. When cars were seriously cool and you could work on them in your driveway with a trip to auto zone, churchs, napa, Pep Boys, etc. I can still picture S10 Blazer Xtremes, real 5.0 mustangs, Z/28 Camaros, LT1 impala SS sedans, Mercury Marauders, Malibu Wagons, Monte Carlo SS and all of those things, the smell of race fuel and hot rubber and all of that! Yeah, it would be nice if the auto industry Gods granted some of us just 10 years. just one more decade of happiness. Wow it would so awesome!!!!!!! SORRY DUDE, THE 2019 CADILLAC CT6-V, HAS AN OPTIONAL DOHC V8. IT’S A LITTLE LOW ON CUBES OF ONLY 4.2 LITERS BUT WITH IT’S TWIN TURBOS, IT PUTS OUT TWO DIFFERENT HP RATINGS. THE LOWER ONE IS 500 HP AND THE BEAST IS 550 HP, WITH 647 LBS FEET OF TORQUE. YES, A BIGGER VERSION IS COMING WITH 5.5 LITERS. IMAGINE THE HP FIGURES ON THAT. IT WILL PROBABLY BE USED IN THE CHEVY SUBURBAN AND TAHOE AND THE NEW SS 1500 SERIES PICKUP TRUCKS. Actually the Blackwing 4.2 liter DOHC V8 engine is just a name for the Caddy version. The 5.5 liter V8 version of this same design DOHC version is being used in the IMSA sports car series in the Prototype Class Caddy DPi. They started using that 5.5 L in the beginning of the 2018 race season, but the IMSA series forced the Caddy team to power down from the 6.2 liter engine used in the 2017 and earlier race seasons, because they were dominating the class. The 5.5 liter does NOT have the twin turbos that the Blackwing has. GM testing has shown about 800 to 850 HP in testing with twin turbos over the past two years. GM will use the new design DOHC V8 engines in the 2020 Suburbans. The 5.5 liter with twin turbos will use less fuel than the existing 6.2 liter in urban type driving, but allow the Cadillac Escalade to have more power than the Lincoln Navigator which uses the V6 turbo. Ford has a 3.0 V6 with twin turbos in the 2020 Lincoln Aviators but it has only 400 HP and 400 lbs feet of torque. Not too bad but at least it’s a much lighter car than the Lincoln Navigator. I can see Lincoln deciding to put a larger engine in the 2020 Navigator when GM uses the 5.5 twin turbo in the high end versions of the Chevy and GMC Suburbans. GM has also run a 6.2 liter of the new DOHV design engine in tests and in race trim puts out 950 HP. That could be detuned for maximum torque for the Caddy Escalade, possibly 650 lbs feet of torque to drive through AWD four wheels. Low end torque is much more important than high end torque when you are moving a 5500 pound huge SUV. We have the HP wars in the SUV’s and it looks like the American cars will beat the Europeans because of the bigger V8’s used in North America. By the way, the 2020 Lincoln Aviator lists for $52,195 for the base model. The hybrid version standard in the Aviator Grand Touring model has an electric boost giving 450 HP and 600 lbs feet of torque and lists for $69,895. I’m a GM guy since birth, but i love the new face and size of the 2020 Aviator. If Ford develops a bigger cube engine with the same hybrid option, for the Navigator, i can see at least 700 lbs feet of torque to compete with the 2020 Caddy Escalades and whatever the big monster engine that GM will put in them. The horsepower wars are here. YAHOO. Vbondjr1 amazing & interesting ideas there.! A lot to swallow. Just one thing though, why even suggest bringing “Pontiac” back from the dead, because it (Pontiac) has never been anything other than a Chevrolet in drag.